The premise was simple... 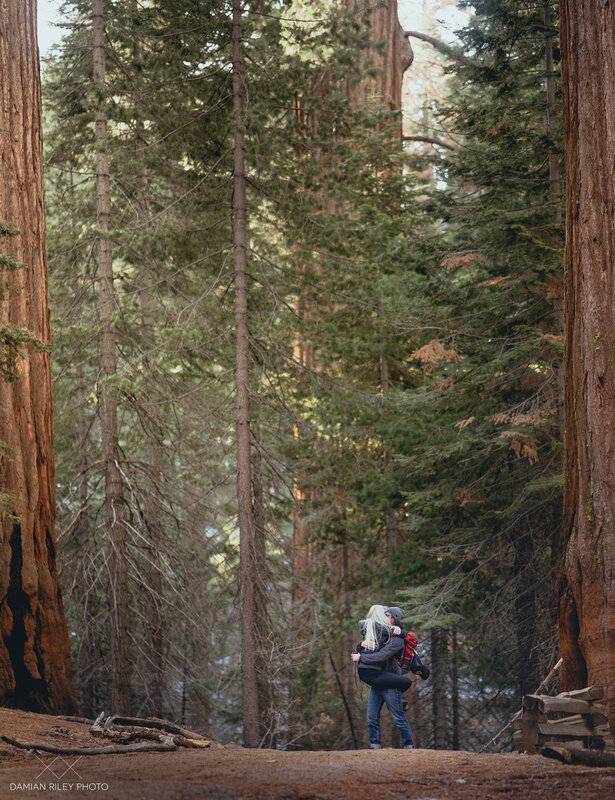 He was going to propose to her in Yosemite, in the Tuloumne Grove of Giant Sequoias. The idea to capture it took crackerjack timing (Jack Burton style). After doing the logistics and finding out approx. what time they would arrive at the grove from Sacramento, I had to make sure that I got to the location at least 45 mins ahead of time to set up and be able to make this work. The trail to the Tuolumne Grove had recently been snowed on and it was pretty much pure ice so getting down the hill was a challenge on it's own. Forgetting my ic crampons at home and sporting summer approach shoes, I might as well have been wearing ice skates. I carefully made my way down the trail, aiding another gentleman that was having some serious problems slipping every 4 feet. After getting in place behind a log big enough to hide me and also providing a good vantage point of anyone coming down the trail I sat and waited for them to arrive. Everything seemed perfect (at first) but then I realized they took a shortcut and nearly ran right into me. Hiding behind a tree just big enough to conceal me, I had to use all of my ninja skills to maneuver around the tree as they passed by, being careful not to break any twigs to give away my position. A quick signal when she was looking away gave the "go ahead" for him to propose... He carefully positioned himself so she could not see me and as he was about to bend down on one knee I started firing away. This was tricky though, I could only stick my head out from the tree far enough to get them in frame but not too far that I could be noticed by her... Afterall, the plan was to have this moment captured totally in secret so he could surprise her with the photos later on. After the shots were captured they wandered off down the trail, I gathered my camera gear and headed the opposite direction towards the car. A drive home and a few hours later, involving the most rushed edits I have ever done, I finally got him the photos to his email and he was able to show her and everyone the moment when she said "yes". This was a fun photo shoot!